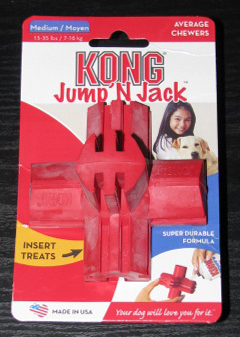 Kong Jump' N Jack Dog Toy. This super durable formula is tough. The dog chew toy comes with cavity to put dog treats in. Great for cleaning teeth and massaging gums. Size is 3.5 x 3.5 inches and is made for medium size dogs weighing 15 to 35 lbs.